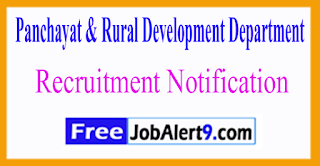 PNRD (Panchayat & Rural Development Department) Has Released Recruitment Notification For 08 Training Coordinator, Master Trainer Posts. All Eligible & Interested Candidates Can Apply Offline,Further Detailed Information Regarding Educational Qualifications, Age Limit, Selection Procedure, Exam Pattern, Syllabus for PNRD (Panchayat & Rural Development Department) Recruitment 2017 - 08 Training Coordinator, Master Trainer Post is mentioned below. Candidates upper age limit should not Exceed 35 -Years As on 01-01-2017. Candidates should have done Graduation Degree / Post Graduation Degree or its equivalent qualification from a recognized university. All Eligible Candidates will Be Selected Based on Their Performance In Interview / Personality Test . All Eligible & Interested candidates Can Download application Form through official website (http://www.wbprd.gov.in). After Filling The application form, candidate must send by hard copies of application a long with relevant testimonials (Mentioned In Detailed Advertisement) to the following Address before / (7th June 2017). Institutional Strengthening of Gram Panchayats (ISGP) Programme, Panchayats & Rural Development Department, Government of West Bengal, Millennium City IT Park, Tower - II, 3rd Floor (Unit D), DN - 62, Sector – V, Salt Lake City, Kolkata – 700091 . Deadline to Submit the Application Is - 07-06-2017. Click Here For PNRD Recruitment 2017,Advertisement.